by Bill Dwight on Monday, December 30, 2013 at 8:48 AM | LEAVE A COMMENT! 2013 is coming to a close, and it’s time to make those dreaded New Year’s resolutions again. Pffft! Are you tired of making and breaking the same old promises each year? You know: lose weight, exercise more, quit your favorite vice, blah, blah, blah. Not. How about switching it up with something new this year? Something that can really change the lives of the people you care most about. Something concrete and doable. 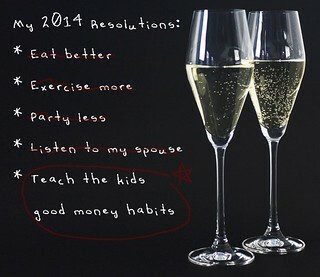 Here’s my simple suggestion: resolve to teach your kids good money habits. Stop handing money over to your kids willy, nilly. Give them accounts (either IOU or prepaid card accounts) that they can access on their own. Teach them to systematically track all of their transactions — both deposits and purchases. Teach them the meaning of a running balance and the importance of keeping it north of zero. 2. Live within a budget. Stop buying everything your kids want or need. Sit down with them and make a very simple budget for one or more focused areas of spending like occasional treats at the check-out stand (a want) or clothing (a need). Then, give them an allowance that matches the agreed upon budgets, and let them manage their own spending. Let them make bad spending decisions, but don’t bail them out. Keep the allowance on a tight schedule (like weekly or monthly), so when they do make bad decisions (they will), they don’t have to wait too long to get a fresh shot at making the right ones. 3. Earn money through hard work. Sadly, there aren’t that many readily accessible job opportunities for kids any more. So create work opportunities for your kids within your own family economy. There must be a few tasks around the house that you’ve been putting off or that you’d rather not do. Offer them up to your kids as paid odd jobs. Clean the garage. Paint the fence. Pick weeds. Or, encourage your kids go the entrepreneurial route: Look after pets when neighbors are out of town. Babysit younger kids in the neighborhood. Sell T-Shirts on Cafe Press. 4. Set money aside for saving before spending. When the money starts rolling in, do your kids march right out and spend it? Teach them the brilliance of automatic savings plans. Create a "payroll deduction" that automatically sets aside a fraction of earnings into a separate long term savings or investment account. Extra bonus: do the same for donations, and teach your kids about the beauty of philanthropy. 5. Make goals and track progress. Do your kids spend money impulsively on stuff they don’t really need or want? Help them gain some financial focus by making specific savings (or donation) goals. Teach them how to monitor their progress and understand how impulsive purchases throw them off track. 6. Put savings to work. Teach your kids that saved money shouldn’t just sit there gathering dust. It should be gathering more value instead. Teach your kids to put their savings to work through the magic of compound interest and patient investing. Is the interest at your local bank too absurdly low to motivate your kids? Then offer them a parent-paid interest rate that models the long term returns of the US stock market. 7. Manage a payment card safely. Ultimately, your kids will need to learn to handle making payments responsibly — both in stores and online. Start them off with prepaid cards. They’re perfect for kids: no risk of running up a debt like with credit cards and no risk of overdrafting like with bank debit cards. Teach your kids how to keep their card information safe and to manage a PIN intelligently. 8. Handle regular bill payments. Someday, your kids will have to manage regular payments for rent, utilities, cable, etc. They’ll need to learn to set aside enough money each month to meet those regular obligations. Give them a head start on bill planning discipline by sharing a few regular expenses with your kids. For example, consider billing your kids at the end of each month for some fraction of the family cell phone plan. Someday, your kids will be making regular payments on cars, houses, or some other major necessities. Let them know what that experience entails. Set up loans from the Bank of Mom/Dad for big ticket purchases like computers or smartphones, and have them make regular payments — perhaps through automatic deductions from allowance or chore payments. Save for retirement? Kids?! now? Yes, yes, yes! In fact, if you only do one thing on this list, I’d recommend doing this one. If you have eligible teens who have made some W-2 income from summer or part-time work, help them get set up with A Roth IRA and sweeten the pot by matching their contributions. It’s called a “Family 401(k),” and you can learn more about this brilliant technique here. Those are some of my favorites. Do you have other suggestions? Please share them with us. If you resolve to be a better mentor to your kids and follow through on a couple of the items above in 2014, I guarantee you’ll feel better about yourself. If you need any help along the way, just stop by our Facebook page to reach out to our community of like-minded parents. As for the dieting, exercising, and vice elimination — well, I’m afraid I can’t help you there beyond wishing you good luck.